In may 1947 EUCOM adopted a policy selling for the replacement of organized Labor Service guard units with industrial police -- individually hired displaced persons and Germans trained in police-type guard duties. The policy had two objectives: In the first place, it would reduce overhead because the industrial police did not receive the rations, clothing, billeting, and other benefits enjoyed by the guard companies. Also, by abolishing the organized guard companies -- completely manned by displaced persons -- the United States would remove an incentive for displaced persons to remain in Germany and resist repatriation or resettlement. The industrial police differed from LS guard units in not having a military-type organization, being limited to one meal a day at a charge of 50 Pfennige per meal that was deducted from monthly payrolls, and not being granted PX privileges. 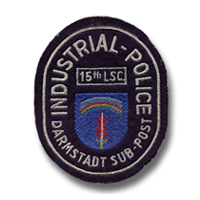 The industrial police guarded U.S. installations, formerly patrolled by LS guard units. Concurrent with employment of industrial police, German civil police were charged with ensuring security of messes, clubs, billets, quarters, and parking lots. Industrial police carried non-automatic carbines and were issued five rounds of ammunition per man when on duty. U.S. military uniforms were dyed blue and issued to the industrial police. Military post commanders were responsible for their training, including orientation in mission and instruction in communications, first aid, English, and weapon firing. While on guard duty industrial police could detain U.S. or Allied personnel apprehended pilfering, damaging, or misusing property. They could detain U.S. and Allied personnel only for the time necessary to turn them over to U.S. supervisory personnel. They also had the power to arrest German nationals and displaced persons who violated regulations they were charged with enforcing. Industrial police were paid in accordance with the applicable Land wage tariff, while organized guards were paid according to a scale established by EUCOM. This scale was considerably higher than the land tariffs for industrial police because DP personnel received preferential treatment. 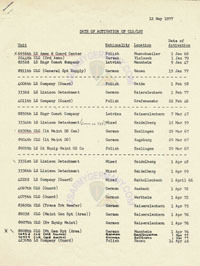 The schedules for industrial police included various grades and locality wage differentials typical of German schedules. By 1949 the LS guard units, with a strength of only 7,000, were not able to meet the support demands of the tactical forces. The static industrial police were unable to fill the gap between service required and that afforded by the organized guard units. At the time there were slightly more than 9,000 industrial police -- approximately 98 percent of them German -- employed as static guards. In July 1950 EUCOM directed the military post commanders to convert industrial police members to LS personnel and to organize them into guard companies. At the time, EUCOM authorized an overall increase of 15,500 in Army LS personnel strengths; industrial police personnel volunteering for labor service duty would fill approximately 7,000 of these spaces, and the remainder would have to be recruited. Certain policy changes were made to facilitate the conversion, as for example the provision that former members of the Waffen SS -- normally disqualified for labor service - might be considered for acceptance on the basis of their records with the industrial police. By the end of 1950 there remained only 400 industrial police, all of than in Berlin. The net effect of the increase in LS personnel was to change the composition of the organization. Whereas until 1950 the labor service had been composed exclusively of displaced persons, the conversion of industrial police to labor service introduced a large block of German nationals into the organization. Of course, with the completion of the resettlement and repatriation program, all displaced persons either had been assimilated into the local economy or had left the Federal Republic. Thus, any former DP personnel who joined labor service after the restoration of guard companies in 1950 were at least nominally Germans. This is a vintage British dark blue Battle Dress jacket. 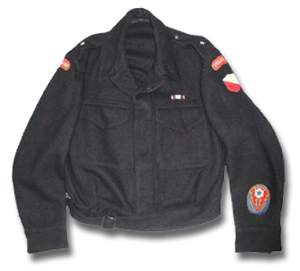 Polish Guards shoulder sleeve insignia with “POLAND” tab (Bevo embroidery). 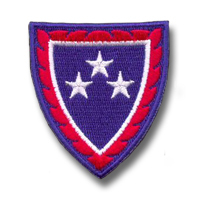 European Theater of Operations patch indicates jacket is from the 1945-46 era and unit was probably assigned to the Theater Service Forces, European Theater (TSFET) command - or its successor, the Continental Base Section (CBS). It all started 40 years ago . . . In August of 1948, German labor offices in the State of Hesse (part of the US Zone of Occupation) hired about 500 German men to provide support to US forces in the ongoing Berlin Airlift. These men were assembled at Ludendorff Kaserne (later to become known as Downs Barracks) in Fulda and divided into two groups to form (on Aug 15, 1948) the first German Labor Service companies - the 7441st LS and 2905th LS Companies. The units were transferred to Frankfurt and billeted in a former German garments factory. They wore US uniforms, dyed black, and received lodging and meals as well as toiletry articles - a luxury in war-ravaged Germany. UNIT DESIGN. STATION MONTH ACTIV. With the end of the Airlift, the original eight German labor service units were disbanded (Sept 1949). However, at the same time new Labor Service technical units were formed such as the 8361st LS Company (Engineer Construction) in Mannheim. HQ EUCOM announced that a Labor Service replacement center has been established at Ludendorff Kaserne, Fulda. The mission of the replacement center is to process Displaced Persons for employment in civilian guard and technical labor service units. The center will provide replacements to offset guard and labor service unit losses. 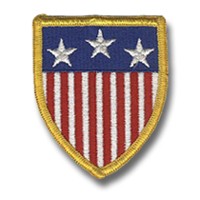 According to Siegbert Mann, webmaster of the Homepage for the Labor Service and Civilian Support Organisation, this patch was also used by the 3331st CSG (UCSA = USAREUR Civilian Support Agency) and other CS Liaison Detachments. The new dress uniform for labor service personnel has been issued to members of the labor service liaison detachment at EUCOM HQ and a priority list has been drawn up to regulate distribution to all units in the European Command. The new uniform, blue-gray in color and similar in appearance to U.S. Army uniforms, was designed by the EUCOM Quartermaster Division according to specifications of the EUCOM Labor Service Division. The overcoat is different from the one worn by the Army, not having a belted back and being straight-hanging. A light blue cotton shirt or a dark blue wool shirt and dark blue tie will be worn with an Eisenhower-type jacket. Personnel other than German nationals will wear a garrison cap similar to the one worn by the U.S. Army. German nationals will wear a mountain-type cap. HQ USAREUR has announced that Labor Service units will now be known as Civilian Support units. THE USAREUR ClVILIAN SUPPORT ORGANIZATION IS UNIQUE IN THE HISTORY OF U.S. FORCES OPERATIONS. DURING MORE THAN THIRTY FIVE YEARS OF DEDICATED SERVICE, IT HAS EVOLVED FROM A BASIC GUARD AND LABOR WORKFORCE INTO A HIGHLY EFFECTIVE AND INCREASINGLY SPECIALIZED TECHNICAL ORGANIZATION PROVIDING MANY DIFFERENT TYPES OF SUPPORT TO U.S. FORCES. UNTIL ITS REDESIGNATION IN JANUARY 1982, THIS ORGANIZATION WAS KNOWN AS THE LABOR SERVICE. - AND, FINALLY, SOME COMMON MISCONCEPTIONS THAT EXIST ABOUT IT. THE USAREUR CIVILIAN SUPPORT ORGANIZATION IS A MOBILE, NON-U.S., CIVILIAN ORGANIZATION CAPABLE OF SELF-SUFFICIENT MISSION PERFORMANCE IN SUPPORT OF U.S. FORCES COMMANDS IN THEIR FULFILLMENT OF NORMAL PEACETIME TASKS. THESE CHARACTERISTICS - MOBILITY, CIVILIAN STATUS AND MISSION PERFORMANCE CAPABILITY - MAKE CIVILIAN SUPPORT UNIQUE. MORE ABOUT THIS LATER. CIVILIAN SUPPORT IS ORGANIZED IN UNITS. EACH UNIT IS DESIGNATED USING A 4 DIGIT NUMBER. IN THE FEDERAL REPUBLIC, THOSE UNITS HAVING SUBORDINATE UNITS ARE FURTHER DESIGNATED AS CENTERS. THEY ARE GENERALLY ANALOGOUS TO BATTALION HEADQUARTERS IN MILITARY ORGANIZATIONS. WORKING LINE UNITS ARE DESIGNATED AS GROUPS: SOME GROUPS ARE SUBORDINATE TO A CENTER WHILE OTHERS ARE SEPARATE AND DIRECTLY SUBORDINATE TO A U.S. UNIT. FINALLY, THERE ARE A NUMBER OF CIVILIAN SUPPORT LIAISON DETACHMENTS. 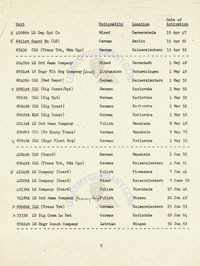 IN BERLIN, UNITS RETAIN THEIR BATTALION AND COMPANY DESIGNATIONS. THE LEGAL BASIS FOR CIVILIAN SUPPORT IN THE FEDERAL REPUBLIC IS CONTAINED IN THE NATO STATUS OF FORCES AGREEMENT (THE SOFA), THE SUPPLEMENTARY AGREEMENT TO THE. SOFA AND THE PROTOCOL OF SIGNATURE THERETO AS WELL AS IN THE BRENTANO-TRIMBLE AGREEMENT, WHICH IS A 1957 AGREEMENT BETWEEN THE GERMAN MINISTRY FOR FOREIGN AFFAIRS AND THE U.S. EMBASSY, BONN. THESE DOCUMENTS ESTABLISH THAT THE MEMBERS OF CIVILIAN SUPPORT GROUPS EMPLOYED BY U.S. FORCES WILL NOT BE CONSIDERED TO BE MEMBERS OF THAT FORCE OR OF ITS CIVILIAN COMPONENT, BUT WILL BE TREATED SIMILARLY TO OTHER GERMAN CIVILIAN LABOR. THE ORGANIZATION OF GERMAN EMPLOYEES IS ALLOWED FOR NON-COMBATANT SERVICES ONLY, INCLUDING CIVILIAN GUARD DUTY. THE WORK FORCE IS PERMITTED TO WEAR UNIFORM WORK CLOTHING AS LONG AS THE CLOTHING DOES NOT RESEMBLE ANY MILITARY UNIFORM SEEN IN THE FEDERAL REPUBLIC. PERSONNEL ARE PROHIBITED FROM RECEIVING MILITARY TRAINING, HOLDING MILITARY RANK AND WEARING MILITARY INSIGNIA. FINALLY, WHILE THE DOCUMENTS MENTIONED PERMIT THE U.S. FORCES TO ORGANIZE NON-GERMAN LABOR, BECAUSE THERE ARE NO LONGER ANY PURE NON-GERMAN UNITS, THE RESTRICTIONS ORIGINALLY APPLICABLE TO UNITS COMPRISED OF GERMAN NATIONALS ONLY APPLY NOW TO THE ENTIRE ORGANIZATION. UNITS IN BERLIN HAVE A SOMEWHAT DIFFERENT STATUS AND ARE GOVERNED BY ALLIED KOMMANDATURA LETTERS. 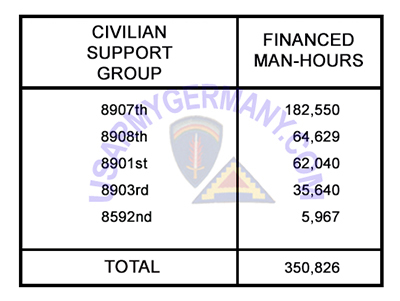 THE CIVILIAN SUPPORT ORGANIZATION ACCOUNTS FOR ABOUT 13% OF THE TOTAL USAREUR CIVILIAN WORK FORCE AND ABOUT 24% OF THE LOCAL NATIONAL COMPONENT OF THE WORK FORCE. CIVILIAN SUPPORT EMPLOYEES, LIKE OTHER LOCAL NATIONALS, ARE COVERED BY THE COLLECTIVE TARIFF AGREEMENT (CTA II) NEGOTIATED BETWEEN THE FEDERAL MINISTRY OF FINANCE, AS THE REPRESENTATIVE OF THE SENDING STATES FORCES, AND COMPETENT GERMAN TRADE UNIONS. BECAUSE OF THE UNIQUENESS OF THE ORGANIZATION, A SPECIFIC SEPARATE APPENDIX TO CTA II. (APPENDIX Z), GOVERNS THE PECULIARITIES OF CIVILIAN SUPPORT EMPLOYMENT. CIVILIAN SUPPORT EMPLOYEES ARE ALSO COVERED BY THE GERMAN PERSONNEL REPRESENTATION LAW GIVING THEM THE RIGHT TO ELECT WORKS COUNCILS. THERE ARE, HOWEVER, A NUMBER OF SIGNIFICANT DIFFERENCES BETWEEN THE RULES GOVERNING CIVILIAN SUPPORT AND OTHER LOCAL NATIONAL EMPLOYEES IN THE AREAS OF ORGANIZATION, MOBILITY, SUBSISTENCE, PERSONNEL, ACCOMMODATIONS, CLOTHING, ADMINISTRATION AND MANAGEMENT. - CIVILIAN SUPPORT IS ORGANIZED IN NUMBERED UNITS WITH STRUCTURES SIMILAR TO MILITARY UNITS. CONSEQUENTLY, CIVILIAN SUPPORT HAS INHERENT SUPERVISORY CAPABILITY, OR WHAT WE WOULD CALL A CHAIN OF COMMAND IN MILITARY UNITS. 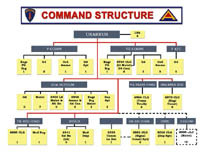 CIVILIAN SUPPORT UNITS ARE ALSO INTEGRATED INTO THE U.S. COMMAND STRUCTURE. THE U.S. COMMANDS, TO WHICH CIVILIAN SUPPORT UNITS ARE ASSIGNED, ARE KNOWN AS PARENT UNITS, AND GIVE MISSION TYPE ORDERS TO THEIR CIVILIAN SUPPORT UNITS IN THE SAME WAY THEY DO TO THEIR U.S. UNITS. THE U.S. COMMANDS ARE THEREFORE RELIEVED OF THE NEED TO PROVIDE DETAILED SUPERVISION AND SERVICES. THE CIVILIAN SUPPORT UNIT SUPERVISORS AND SUPERINTENDENTS ARE RESPONSIBLE FOR THE MOST EFFICIENT AND EFFECTIVE OPERATION OF THEIR UNITS INCLUDING MISSION ACCOMPLISHMENT, MORALE, WELFARE, RECRUITMENT, SUBSISTENCE, PROMOTION AND SO FORTH. - MOBILITY IS ANOTHER MAJOR OPERATIONAL ADVANTAGE OF CIVILIAN SUPPORT. THE TARIFF AGREEMENT AND THE CIVILIAN SUPPORT INDIVIDUAL EMPLOYMENT CONTRACT PERMIT EMPLOYEES TO BE RELOCATED TEMPORARILY OR PERMANENTLY, INDIVIDUALLY OR IN GROUPS THROUGHOUT THE FEDERAL REPUBLIC, MAKING CIVILIAN SUPPORT RESPONSIVE TO CHANGING REQUIREMENTS. UNITS ALSO ROUTINELY PARTICIPATE IN SUPPORT OF U.S. FORCES IN FIELD EXERCISES. - BASED ON THIS MOBILITY, CIVILIAN SUPPORT EMPLOYEES ARE AUTHORIZED SUBSISTENCE AND, WHERE IT IS REQUIRED AND POSSIBLE, ALSO ACCOMMODATIONS EQUIVALENT TO THE SUBSISTENCE AND ACCOMMODATIONS PROVIDED BY THE ARMY TO U.S. MILITARY PERSONNEL. CIVILIAN SUPPORT UNITS OPERATE 19 SINGLE UNIT OR CONSOLIDATED DINING FACILITIES, SOME OF WHICH FEED U.S. PERSONNEL AS WELL. MOST LIVING ACCOMMODATIONS CONSIST OF ROOMS IN BARRACKS, MADE AVAILABLE TO THOSE EMPLOYEES DESIRING TO RESIDE IN GOVERNMENT QUARTERS. SOCIAL FACILITIES SUCH AS DAYROOMS, CANTEENS AND CLUBS ARE AVAILABLE AS WELL IN SOME LOCATIONS. - BASED ON JOB REQUIREMENTS, CIVILIAN SUPPORT EMPLOYEES ARE ISSUED VARIOUS TYPES OF UNIFORM WORK CLOTHING .FOR WEAR DURING THE WORK DAY. SPECIALIZED CLOTHING IS ALSO ISSUED. FOR EXAMPLE, MECHANICS ARE ISSUED COVERALLS, CONSTRUCTION PERSONNEL HAVE SAFETY HELMETS AND PERSONNEL WITH OUTDOOR JOBS RECEIVE WET WEATHER CLOTHING. ROOMS ARE PROVIDED IN THE UNITS TO PERMIT CHANGING INTO AND OUT OF STREET CLOTHING. - WHEREAS OTHER LOCAL NATIONALS ARE ADMINISTERED BY CIVILIAN PERSONNEL OFFICES, THE CIVILIAN SUPPORT ORGANIZATION IS STRUCTURED TO PERFORM ITS OWN PERSONNEL MANAGEMENT TO INCLUDE PAY AND POSITION MANAGEMENT AND ALL OTHER ADMINISTRATIVE FUNCTIONS. IN ACCORDANCE WITH APPENDIX Z TQ THE COLLECTIVE TARIFF AGREEMENT, CIVILIAN SUPPORT HAS ITS OWN PAYGRADE STRUCTURE WHICH USES PREFIXES ZA, ZB, ZW AND ZS. THE ZA PAYGRADES, RANGING FROM 1 THROUGH 6, DESIGNATE "BLUECOLLAR" POSITIONS. THE ZB PAYGRADES, RANGE FROM 1 THROUGH 11 WITH 1 THROUGH 6 GENERALLY DESIGNATING NON-SUPERVISORY "WHITE COLLAR" POSITIONS, AND 7 THROUGH 11 GENERALLY DESIGNATING SUPERVISORY "WHITE COLLAR" POSITIONS. GUARDS IN THE FEDERAL REPUBLIC, BECAUSE OF THE SPECIAL REQUIREMENTS OF THEIR JOBS, ARE DESIGNATED USING GRADES ZW 1 THROUGH ZW 4. IN BERLIN, GUARDS ARE DESIGNATED USING GRADES ZS 1 THROUGH ZS 4. ACTION IS UNDERWAY TO ALIGN CIVILIAN SUPPORT PAY WITH THAT OF OTHER LOCAL NATIONALS IN ACCORDANCE WITH THE PHILOSOPHY OF EQUAL PAY FOR EQUAL WORK. RECRUITMENT, A RESPONSIBILITY OF EVERY SUPERINTENDENT AND SUPERVISOR, IS DONE ON A DECENTRALIZED BASIS BY ALL UNITS. IN THE CASE OF SPECIAL AND CRITICAL SKILLS, THE USAREUR CIVILIAN SUPPORT AGENCY ASSISTS INDIVIDUAL UNITS. CIVILIAN SUPPORT ALSO HAS ITS OWN PROMOTION SYSTEM; THE MERIT PROMOTION SYSTEM, UNDER WHICH VACANCIES ARE FORMALLY ANNOUNCED. ANYONE MAY APPLY FOR VACANCIES. THOSE WHO ARE QUALIFIED ARE INTERVIEWED BY A BOARD. THE SELECTION DECISION IS MADE BY THE BOARD, COMPRISED OF 3 OR 5 CIVILIAN SUPPORT MEMBERS AND CHAIRED BY THE SUPERVISOR OF THE UNIT IN WHICH THE VACANCY EXISTS. THE BOARD MUST INCLUDE A DISINTERESTED CIVILIAN SUPPORT MEMBER AND AN INCUMBENT OF A POSITION SIMILAR TO THE VACANT POSITION, WHO PROVIDES TECHNICAL EXPERTISE AND THE BOARD MAY INCLUDE A NON-VOTING OBSERVER WHO IS NORMALLY A UNIT WORKS COUNCIL MEMBER. ADDITIONAL OBSERVERS ARE PERMITTED. WHILE MERIT PROMOTION FROM WITHIN CIVILIAN SUPPORT IS PREFERRED, THE "BEST QUALIFIED" CRITERION TAKES PRECEDENCE AND SOMETIMES RESULTS IN LATERAL ENTRY OR HIRE OFF THE STREET. IN RECOGNITION OF THE IMPORTANT SUPPORT PROVIDED U.S. FORCES BY CIVILIAN SUPPORT, EXEMPTION FROM CONSCRIPTION INTO THE GERMAN ARMED FORCES IS GRANTED THOSE WHO REQUEST IT AND WHOSE UNIT SUPERVISOR APPROVES AND FORWARDS THE REQUEST. ALL NEW EMPLOYEES ARE SUBJECTED TO EMPLOYMENT SUITABILITY SCREENING. CERTAIN KEY CIVILIAN SUPPORT PERSONNEL ARE GIVEN LIMITED ACCESS AUTHORIZATIONS (LAAs) UP TO SECRET TO ACCOMPLISH THEIR JOBS. THE USAREUR CIVILIAN SUPPORT AGENCY (UCSA)(PROV), WITH HEADQUARTERS IN HEIDELBERG, IS A USAREUR ASSIGNED UNIT WHICH OPERATES UNDER THE GENERAL STAFF SUPERVISION OF THE DEPUTY CHIEF OF STAFF, PERSONNEL. PROVIDING POLICY DEVELOPMENT, PROGRAM OBJECTIVES AND PROGRAM DIRECTION IN THE AREAS OF ADMINISTRATION, ORGANIZATION, EQUIPMENT, PERSONNEL, PAY AND POSITION MANAGEMENT, LOGISTIC SUPPORT AND TRAINING FOR THE CIVILIAN SUPPORT PROGRAM IN USAREUR AND PARTICIPATING COMMANDS. BY CINCUSAREUR DIRECTIVE, ALL US COMMAND ACTIONS WHICH AFFECT THE ORGANIZATION ARE COORDINATED WITH THE AGENCY. AS MENTIONED EARLIER, CIVILIAN SUPPORT UNITS ARE SUBORDINATE TO THE U.S. COMMANDS TO WHICH THEY ARE ASSIGNED, THEIR "PARENT UNIT", IN SOME INSTANCES, ONE OR MORE INDIVIDUAL UNITS ARE ASSIGNED DIRECTLY TO A U.S. COMMAND. THESE "SEPARATE" UNITS ARE SHOWN HERE WITH BLOCKS ARRANGED VERTICALLY WITHOUT INDENTATION. IN OTHER CASES, A NUMBER OF UNITS ARE FURTHER SUBORDINATED T0 A HEADQUARTERS CIVILIAN SUPPORT UNIT ORGANIZED TO EXERCISE OPERATIONAL AND/OR ADMINISTRATIVE SUPERVISION OVER THEM, THUS REDUCING THE SPAN OF CONTROL CONFRONTING THE U.S. COMMAND. THESE ARE REFERRED TO AS CENTERS, (IN BERLIN, BATTALION), WITH NUMERICAL DESIGNATIONS IN THE 6900 SERIES. THEY ARE HEADED BY A SUPERINTENDENT. THE RELATIONSHIP IS SHOWN HERE BY THE INDENTED STAIRSTEP BLOCKS. Click on the thumbnail to view a larger resolution of the chart. THE SLIDES THAT FOLLOW PROVIDE A CLOSER LOOK AT THE INTEGRATION OF CIVILIAN SUPPORT UNITS INTO THE U.S. COMMAND STRUCTURE. - U.S. COMMANDS ARE SHOWN IN (GRAY) WHILE CIVILIAN SUPPORT-PECULIAR ORGANIZATIONS, THAT IS CIVILIAN SUPPORT UNITS AND THE CIVILIAN SUPPORT AGENCY, ARE SHOWN IN (YELLOW). THE NUMBERS IN THE BLOCKS INDICATE THE NUMBER OF OIFFERENT UNITS IN EACH CASE. - CIVILIAN SUPPORT UNITS ALSO HAVE COOKS, MECHANICS, DRIVERS, CLERKS, AND OTHERS AS REQUIRED. - AS WELL AS EQUIPMENT REQUIRED BY THE MISSION SUCH AS SMOKE GENERATORS, AND ENGINEER EQUIPMENT. - ALSO AVAILABLE IN EACH UNIT, AS REQUIRED, ARE SPACE FOR UNIT ADMINISTRATION, HOUSING, SUPPLY ROOMS, ARMS ROOMS, DINING FACILITIES. WORKSITES, AND OTHER EQUIPMENT STORAGE AREAS. - A UNIT STRENGTH OF 100 -150 IS TYPICAL. U.S. COMMANDS GAIN ADDITIONAL FLEXIBILITY FROM THE EXTENSIVE USE OF CIVILIAN SUPPORT DETACHMENTS. THE 82 UNITS CURRENTLY HAVE 44 DETACHMENTS AND SECTIONS OPERATING AT SEPARATE LOCATIONS. DETACHMENTS ARE USED PRIMARILY BY GUARD AND AMMUNITION UNITS AND ARE RESPONSIVE TO MISSIONS AT REMOTE SITES REQUIRING LESS THAN A FULL UNIT. IN ADDITION TO THESE 44 DETACHMENTS AND SECTIONS, 32 DISPENSARIES LOCATED THROUGHOUT THE FEDERAL REPUBLIC ARE OPERATED BY THE MEDICAL SERVICE CIVILIAN SUPPORT UNIT IN SUPPORT OF OTHER UNITS. IN SUPPORT OF THE 5TH SIGNAL COMMAND, A SIGNAL SUPPORT UNIT HAS 21 TEAMS AT WIDELY DISPERSED MICROWAVE RADIO SITES. FOR A VARIETY OF REASONS, MANY CIVILIAN SUPPORT UNITS ARE MORE COST EFFECTIVE THAN LIKE U.S. MILITARY UNITS. CIVILIAN SUPPORT ORGANIZATION IS PRECISELY TAILORED TO THE UNIT'S MISSION AND SITUATION AND IS REVIEWED PERIODICALLY. CIVILIAN SUPPORT UNITS ALSO USUALLY HAVE LESS TURNOVER THAN CORRESPONDING U.S. UNITS AND ARE, THEREFORE, MORE PROFICIENT IN ACCOMPLISHING THEIR MISSIONS. CIVILIAN SUPPORT EMPLOYEES DEVOTE ESSENTIALLY FULL TIME TO PRODUCTIVE WORK WHEREAS U.S. UNITS MUST COPE WITH MANY NON-PRODUCTIVE DISTRACTIONS. PHYSICAL SECURITY MISSIONS ARE PERFORMED BY 15 GUARD UNITS IN THE FEDERAL REPUBLIC ASSIGNED TO V AND VII CORPS, 7TH ARMY TRAINING COMMAND & 21ST SUPPORT COMMAND AND ONE GUARD BATTALION IN BERLIN. OPERATING WITH THEIR DETACHMENTS FROM SOME 40 LOCATIONS, THEY PROVIDE PHYSICAL SECURITY FOR VARIOUS INSTALLATIONS, SUCH AS EQUIPMENT PRESTOCK POINTS, CONVENTIONAL AMMUNITION STORAGE SITES, RADIO SITES, DEPOTS AND HEADQUARTERS. THE SINGLE LARGEST TASK OF GUARD UNITS IS SECURING CONVENTIONAL AMMUNITION. DEPENDING ON THE SITUATION, THE GUARD UNITS EMPLOY SOME COMBINATION OF STATIC AND WALKING POSTS, MOTORIZED PATROLS, GUARD DOGS AND ELECTRONIC INTRUSION DETECTORS. COMPARED TO CONTRACT GUARDS, CIVILIAN SUPPORT GUARD UNITS OFFER THE ADVANTAGES OF MOBILITY, RESPONSIVENESS, RELIABILITY, AND DEPENDABILITY. THE RESULT IS IMPROVED SECURITY. AMMUNITION MAINTENANCE, STORAGE, SURVEILLANCE AND HANDLING IS ACCOMPLISHED BY SEVEN CIVILIAN SUPPORT UNITS ASSIGNED TO BOTH CORPS & 21ST SUPPORT COMMAND. THEY OPERATE WITH THEIR DETACHMENTS FROM 15 LOCATIONS AT OVER 50 DIFFERENT AMMUNITION SITES. DEPENDING ON THE WORKSITE CONDITIONS, THEY USE EITHER ROUGH TERRAIN MATERIAL HANDLING EQUIPMENT (MHE) OR COMMERCIAL TYPE MHE. GUARD AND AMMUNITION UNITS WORK CLOSELY TOGETHER, FREQUENTLY UNDER THE OPERATIONAL CONTROL OF THE SAME US ELEMENT. ENGINEER FLOAT BRIDGING IS PROVIDED BY TWO FLOAT BRIDGE UNITS; ONE ASSIGNED TO EACH CORPS. WHILE THEY ARE NOW ORGANIZED AS RIBBON BRIDGE UNITS, THEY RETAIN THE CAPABILITY OF EMPLOYING CLASS 60 AND PANEL BRIDGES AS WELL. MAINTENANCE OF BRIDGING EQUIPMENT IS DONE BY TWO UNITS ASSIGNED TO THE 21ST SUPPORT COMMAND, ONE MAINTAINING CLASS 60 AND OTHER DEPOT BRIDGE STOCKS. THE OTHER MAINTAINING PRIMARILY MOBILE ASSAULT AND RIBBON BRIDGES. MAINTENANCE FUNCTIONS FOR A WIDE RANGE OF EQUIPMENT AT THE DIRECT SUPPORT AND GENERAL SUPPORT LEVELS AS WELL AS ON AN AREA BASIS ARE PERFORMED BY EIGHT UNITS WITHIN VII CORPS & 21ST SUPPORT COMMAND. ONE OF THESE, A COMMUNICATIONS-ELECTRONICS MAINTENANCE UNIT, ALSO SUPPORTS DARCOM. ON A DUAL MISSION BASIS. THE 6900TH SMOKE GENERATOR CENTER, WITH FOUR SUBORDINATE UNITS, MAINTAINS POMCUS STOCK FOR THE COMBAT EQUIPMENT GROUP, EUROPE (CEGE) AND PROVIDES SMOKE GENERATING SUPPORT FOR THE TACTICAL UNITS IN USAREUR. THIS IS THE ONLY ACTIVE SMOKE GENERATOR UNIT AVAILABLE TO THE U.S. ARMY. THREE GENERAL SUPPORT SUPPLY UNITS IN THE TWO CORPS AND 21ST SUPPORT COMMAND RECEIVE, STORE AND ISSUE REPAIR PARTS AS WELL AS SELECTED ITEMS OF CLOTHING, TENTAGE, TOOLS AND CONSTRUCTION MATERIALS. DEPOT SUPPORT UNITS IN VII CORPS, 21ST SUPPORT COMMAND, 7TH MEDICAL COMMAND AND THE DEFENSE SUBSISTENCE REGION, EUROPE (A DEFENSE LOGISTICS AGENCY ACTIVITY) WORK WITH A WIDE RANGE OF COMMODITIES PROVIDING RECEIPT, STORAGE, CARE, PRESERVATION AND ISSUE SERVICES FOR GENERAL SUPPLIES AND MAJOR END ITEMS INCLUDING COLD STORES AND MEDICAL ITEMS. TRANSPORTATION SUPPORT IS PROVIDED BY THE 6966TH CSC ASSIGNED TO THE 4TH TRANSPORTATION COMMAND WHICH HAS SEVEN SUBORDINATE CSG: THREE MEDIUM TRUCK UNITS, ONE REEFER UNIT, ONE HEAVY EQUIPMENT TRANSPORTER UNIT AND TWO TRAILER TRANSFER POINTS. THIS UNIT PROVIDES MOTOR HIGHWAY TRANSPORTATION FOR NUMEROUS COMMODITIES INCLUDING AMMUNITION AND TRACKED VEHICLES, AND MOVES NEARLY ALL FROZEN FOOD REQUIRED BY THE ARMY AND AIR FORCE. ENGINEER CONSTRUCTION IS PERFORMED BY THE 6970TH CSC, ASSIGNED TO THE 18th ENGINEER BRIGADE, WITH SIX SUBORDINATE CONSTRUCTION UNITS WHO HAVE THE MISSION OF PERFORMING ENGINEER PLANNING AND DESIGN, CONSTRUCTING, REHABILITATING AND MAINTAINING COMMUNICATION ROUTES, BUILDINGS AND OTHER FACILITIES AND PERFORMING RELATED ENGINEERING TASKS. CONSTRUCTION CREWS FROM THESE UNITS CAN BE SEEN REGULARLY THROUGHOUT THE FEDERAL REPUBLIC WORKING ON MANY VARIED PROJECTS. THIS UNIT ALSO OPERATES TWO ROCK QUARRIES. MEDICAL SERVICE SUPPORT TO CIVILIAN SUPPORT UNITS IS PROVIDED BY A MEDICAL SERVICE UNIT ASSIGNED TO THE 7TH MEDICAL COMMAND WHICH OPERATES DISPENSARIES THROUGHOUT THE FEDERAL REPUBLIC AND BY A DISPENSARY IN BERLIN. SIGNAL CONSTRUCTION AND SUPPORT TO THE 5TH SIGNAL COMMAND IS PROVIDED BY SIX UNITS. IN ADDITION TO THEIR WORK IN GERMANY, SMALL CONTACT TEAMS FROM THESE UNITS OFTEN PROVIDE, ON A TDY BASIS, EXPERT KNOWLEDGE AND SUPPORT FOR U.S. FORCES COMMUNICATIONS SYSTEMS LOCATED OUTSIDE OF THE FEDERAL REPUBLIC. FINALLY, THERE ARE SEVERAL LIAISON DETACHMENTS WHICH ASSIST US COMMANDS IN CONTROLLING ASSIGNED CIVILIAN SUPPORT UNITS. FUTURE EXPANSION OF THE CIVILIAN SUPPORT ORGANIZATION MAY INCLUDE THE ACTIVATION OF UNITS WITH NEW KINDS OF MISSIONS NOT NOW PERFORMED BY THE ORGANIZATION. THIS IS A BREAKOUT BY NATIONALITY. WHILE CLEARLY A MULTINATIONAL WORKFORCE, 85% OF CIVILIAN SUPPORT EMPLOYEES TODAY ARE GERMAN CITIZENS. MOST OF THE NON-GERMAN EMPLOYEES, WHO ARE PREDOMINANTLY OF POLISH OR BALTIC ORIGIN, HAVE OBTAINED HOMELESS FOREIGNER STATUS, A LEGAL STATUS AWARDED BY THE FEDERAL REPUBLIC IN ACCORDANCE WITH THE GENEVA CONVENTION. HOMELESS FOREIGNERS HAVE ALL THE RIGHTS ANO OBLIGATIONS OF GERMAN CITIZENS EXCEPT VOTING, SERVING IN THE ARMED FORCES AND HOLDING ELECTED PUBLIC OFFICE. THIS BREAKOUT BY AGE SHOWS THAT THE CIVILIAN SUPPORT WORK FORCE IS A RELATIVELY YOUNG ONE, AS EVIDENCED BY THE 34 YEAR AVERAGE AGE OF THE GERMAN EMPLOYEES. NON-GERMANS, WHO WERE THE ORIGINAL WORK FORCE, OF COURSE ACCOUNT FOR A DISPROPORTIONATE SHARE OF THE OLDER EMPLOYEES. THIS BREAKOUT BY LENGTH OF EMPLOYMENT INDICATES THE HIGH DEGREE OF STABILITY AND CONTINUITY WHICH EXISTS. THE CIVILIAN SUPPORT ORGANIZATION BENEFITS GREATLY FROM THIS RETAINED EXPERIENCE. WOMEN ARE INCREASINGLY EVIDENT AMONG CIVILIAN SUPPORT EMPLOYEES, NOW NUMBERING OVER 500. FEMALE EMPLOYEES ARE AFFORDED THE SAME OPPORTUNITIES AS THEIR MALE COLLEAGUES WITH THE EXCEPTION OF CERTAIN RESTRICTIONS NECESSITATED BY GERMAN LAW REGARDING EMPLOYMENT CONOITIONS, SUCH AS, NO WORK AFTER 2300 HOURS AND NO ROTATING SHIFT WORK. ACCORDINGLY, WOMEN ARE NOT EMPLOYED AS GUARDS BECAUSE OF THE GUARD SHIFT SYSTEM. AS A MATTER OF POLICY, WOMEN ARE NOT REQUIRED TO RECEIVE WEAPONS TRAINING NOR ARE THEY ASSIGNED DUTIES REQUIRING THE BEARING OF ARMS. CERTAIN FACILITIES FOR WOMEN ARE, OF COURSE, SEPARATE FROM THOSE FOR MEN, SUCH AS, RESTROOMS, CLOTHES CHANGING ROOMS AND INDIVIDUAL QUARTERS ROOMS. THERE ARE A NUMBER OF MISCONCEPTIONS ABOUT CIVILIAN SUPPORT. MOST OF THESE ARISE FROM THE FACT THAT, WHILE ALL PERSONNEL ARE CIVILIANS AND THEIR JOBS NONCOMBATANT TASKS, THEIR ORGANIZATION AND MISSIONS BEAR SOME RESEMBLANCE TO THOSE OF THE US ARMY AND INVOLVE WORK WITH MILITARY EQUIPMENT IN CLOSE DAILY ASSOCIATION WITH THE U.S. MILITARY. CIVILIAN SUPPORT EMPLOYEES DO NOT HOLD AND SHOULD NOT BE ADDRESSED BY MILITARY RANK. THERE ARE NO "OFFICERS". "NCO's" OR "MEN" NOR SHOULD ANY SUCH DISTINCTIONS BE MADE. EMPLOYEES HAVE JOB TITLES AND PAYGRADES. MAY WEAR PAYGRAOE INSIGNIA AND SHOULD BE ADDRESSED ACCORDINGLY, OR SIMPLY AS "MISTER", "MRS." OR "MISS". CIVILIAN SUPPORT EMPLOYEES WEAR UNIFORM WORK CLOTHING WHICH CAN BE DISTINGUISHED AT ALL TIMES BY THE DISTINCTIVE RED, WHITE AND BLUE LEFT SHOULDER SLEEVE INSIGNIA OR CIVILIAN SUPPORT PATCH WHICH IS REQUIRED TO BE WORN ON ALL OUTER GARMENTS. IN THE CASE OF CIVILIAN SUPPORT BLUE-GRAY UNIFORM WORK CLOTHING, ITS DISTINCTIVE COLOR IS AN ADDITIONAL DISTINGUISHING FEATURE. IN SOME UNITS, DISTINCTIVE UNIT PATCHES ARE WORN AS WELL. CIVILIAN SUPPORT EMPLOYEES MAY NOT RECEIVE MILITARY TRAINING IN SUCH SUBJECTS AS INDIVIDUAL OR UNIT TACTICS, TECHNIQUES OF FIRE, CLOSE ORDER DRILL, PHYSICAL FITNESS, AUTOMATIC AND CREW SERVED WEAPONS OR MANUAL OF ARMS. THEY DO NOT NORMALLY PARTICIPATE IN ROUTINE PRACTICE ALERTS OR READINESS TESTING. NBC TRAINING IS REQUIRED FOR ALL EMPLOYEES BUT INCLUDES ONLY DEFENSIVE ASPECTS. TRAINING WITH THEIR ASSIGNEO INDIVIDUAL WEAPON INCLUDING FIRING IS REQUIRED OF MALE PERSONNEL OTHER THAN MEDICAL PERSONNEL AND CLERGY. WEAPONS TRAINING IS NECESSARY BECAUSE GUARDS ARE ROUTINELY ARMED, WHILE OTHER MALE EMPLOYEES MAY BE REQUIRED TO SECURE WORKSITES, PROPERTY AND EQUIPMENT TEMPORARILY. CIVILIAN SUPPORT EMPLOYEES ARE SUBJECT TO INSPECTOR GENERAL ANO COMMAND INSPECTIONS BUT MAY NOT BE REQUIRED TO DISPLAY ISSUED EQUIPMENT IN A FORMAL MANNER, TO FORM FOR INSPECTION IN RANKS OR UNDER ARMS OR BE REQUIRED TO OBSERVE MILITARY STANDARDS OF CONDUCT AND APPEARANCE. THE RECENT STRENGTH TREND IS SHOWN HERE. THIS TREND AND THE CURRENT CONSIDERABLE FURTHER EXPANSION OF THE ORGANIZATION DESIRED BY U.S. COMMANDS IS TESTIMONY TO THE EFFECTIVENESS AND DEDICATION OF THE CIVILIAN SUPPORT ORGANIZATION, THE HIGH ESTEEM IN WHICH IT IS HELD BY U.S. COMMANDS AND ITS VALUABLE CONTRIBUTION TO US FORCES. Foreign nationals are local national or third country national civilians hired directly by the Army as individuals who collectively comprise the bulk of the work force of a support organization or are employed to augment a military support unit. Civilian Support Units are quasi-military units organized similiarly to U.S. military support units. CSU personnel are hired collectively from local or third country populations. Host Nation support includes that support provided by governmental or quasi-governmental agencies of foreign governments. Another form of civilian staffing used by the Army in the direct maintenance mission is the CSU. Those are quasi-military in that they are organized and operate, in many respects, like military units. They have unit missions, a rank structure, uniforms, unit billeting and messing facilities, and orderly and administrative tasks in addition to their primary jobs. Also, CSU hiring procedures and pay scales are different from those for individual direct-hire foreign nationals. However, CSUs cannot be assigned military missions nor de deployed. The 103 CSUs in Europe have a total assigned strength of nearly 12,000 personnel, and have a variety of missions including security, ordnance, engineer, supply, transportation, medical service and supply, signal support, and maintenance. Maintenance CSUs are organized into battalion level units called Civilian Support Centers (CSCs) and company level units called Civilian Support Groups (CSGs). The latter are typically staffed as about 60 percent of equivalent-mission, full strength US military companies. Some maintenance CSUs have mixed missions. That is, part of a unit may be devoted to direct maintenance while another part may be assigned to related functions such as Care of Supplies in Storage (COSIS). When these mixed missions occur, the COSIS mission is generaly consistent with the unit's primary mission. For example, if a unit's primary mission is DS maintenance of automotive equipment, then its COSIS mission is likely centered around upkeep of wheeled vehicles in storage. COSIS missions frequently require some CSUs to station detachments away from the unit's primary location. Table 2-9 shows the current staffing, missions, locations, and command assignments of maintenance CSU's 1). The staffing data include all assigned personnel even though some may be performing related tasks or assigned to detached locations. 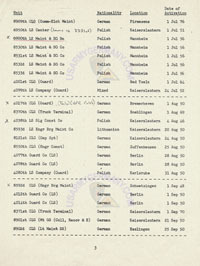 The location shown in the table is that of unit headquarters where most personnel are usually assigned. The staffing of maintenance CSUs totals 2,238 personnel, with slightly more than one-half in units assigned to the 21st SUPCOM. The other maintenance CSUs are either in VII Corps or with the 5th Signal Command. V Corps has no maintenance CSUs although other types of CSUs are assigned. CSUs have a variety of maintenance missions. Many support operating units directly; some are assigned TARP or COSIS missions, and others, such as units in the 5th Signal Command, have diverse missions. CSUs in VII Corps generally support operating units, while those in 21st SUPCOM serve in several roles. For example, the 4506th and 8593rd both support automotive equipment, with the 4506th also supporting light tracked vehicles. Both have COSIS missions, though not to the same degree. As much as 85 percent of the 8593rd's capacity is devoted to COSIS workload, versus just a small fraction of the 4506th's. Both also have detachments located at equipment storage sites. Approximately one-third of the personnel of the 8593rd is detached to the North Point site in Moersfeld. The 4506th has a smaller detachment at Berg, the South Point site. The 8592nd supports bridging equipment, operates the USAREUR Bridge Park and performs some TARP repairs. The 8901st operates much like a heavy equipment maintenance company, providing support to automotive, armament, and fire control equipment. So, too, does the 8903rd, but with special emphasis on fire control equipment. Both units, along with the 8908th, are assigned TARP missions. The 8907th does automotive work and supports TARP, being the primary contributor to the Jeep body replacement program. It also operates a batter shop for KMC 1). The 8909th differs from other units, both in its diverse missions and unusual organizational relationships. 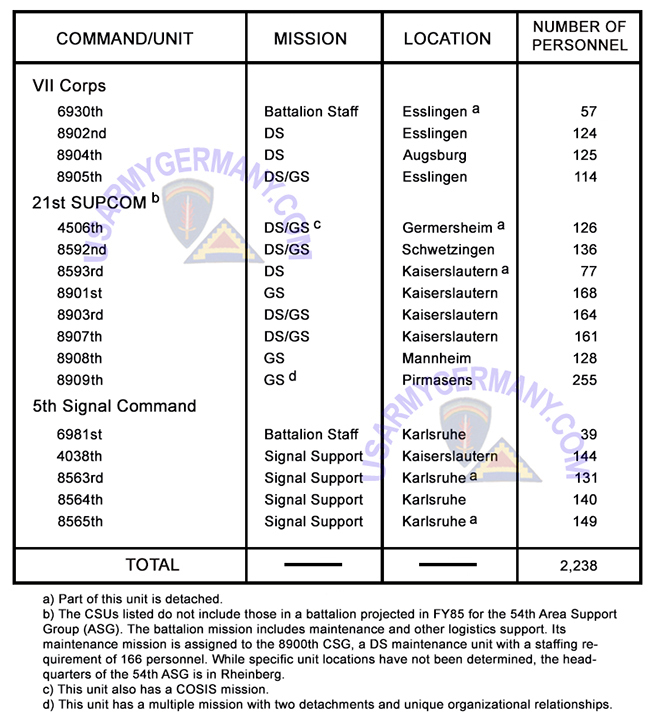 As a unit, it reports directly to General Support Center Germersheim but assigns most of its personnel to PCMC 2) in support of the TARP communications-electronics mission. The 8909th also provides 26 personnel to the 517th Maintenance Battalion, a unit of AMC-Europe. Those personnel serve in three different roles. Eight personnel are used in supply and support functions at battalion headquarters in Zweibrücken. 18 are in Pirmasens assisting the 524th Maintenance Company; of the 18, 10 are employed in the nucleonics laboratory and the remaining 8 support the special repair authorization mission for TMDE 3). Only CSGs in the 21st SUPCOM support TARP. The extent of that support is shown in Table 2-10. Table 2-10: CGS Support of FY85 TARP. Together, the five CSGs provide 350,826 man-hours to TARP, which represents approximately 9 percent of the total workload, with the preponderance contributed by the 8907th. Not shown in the table is the TARP contribution of the 8909th. That unit provides substantial communications-electronics support to TARP by the contribution of its personnel assigned to PCMC. Data for that are commingled with PCMC's TARP production data, however, and are not separately available. The maintenance mission of the CSUs assigned to the 5th Signal Command cannot be readily separated from their other signal support functions. Typically, those units lay cables, repair antenna towers, operate and maintain microwave sites, and test and repair cables. 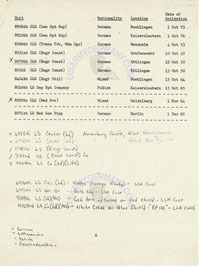 For example, the 8563rd in Karlsruhe has 131 assigned personnel, of which 54 lay, test, and repair cables; 16 maintain antennas in the Kaiserslautern area; and 61 operate and maintain 21 microwave sites. a. Outlines the Civilian Support (Civ Spt) concept. b. Prescribes the use of Civ Spt units. c. Outlines responsibilities and procedures for the supervision, administration, operation, and logistical support of Civ Spt units. a. USAREUR Civ Spt provides a mobile, noncombatant civilian work force capable of carrying out assigned peacetime missions independently in support of USAREUR commands. Under the Wartime Host Nation Support (WHNS) Agreement (15 April 1982), certain Civ Spt units provide the nucleus of German Army (Bundeswehr (BW)) units that continue to support the U.S. Forces in times of crisis or war. Command and staff responsibilities concerning the organization, use, management, personnel administration, training, and logistic support of USAREUR Civ Spt units are in USAREUR regulations in the 600-400 series and other related USAREUR publications. b. The Civ Spt organization is a component of the USAREUR civilian local national (LN) work force. The conditions for employment established in the Brentano-Trimble Agreement (11 April 1957) are applicable to the entire Civ Spt organization. c. Civ Spt units are subordinate to the U.S. commands (parent units or supervising units) to which they are assigned. Each Civ Spt unit is assigned a unit number and unit identification code (UIC). The organization, position structures, and authorized and required equipment of units are documented on DA-approved tables of distribution and allowances (TDAs). d. Civ Spt units perform their assigned missions or provide personnel for carrying out missions under the operational control of using U.S. commands. The established criteria and requirements for the organization and augmentation of TDA activities (for example, availability of manpower, monetary and equipment resources, stationing) apply equally to Civ Spt units. Additional important factors to be considered are the availability of dining facilities and housing for Civ Spt personnel. (1) Administration and operational control of subordinate Civ Spt units. b. Restrictions on the use of Civ Spt units are listed in (1) and (2) below. (1) Civ Spt units, or any part of a Civ Spt unit, normally will be used only for duties compatible with missions identified in authorization documents. Temporary use for duties other than those described in authorization documents may be authorized in exceptional cases if the duties assigned are reasonable. Written requests for temporary use in exceptional cases will be sent through command channels to the Commander, USAREUR Civilian Support Agency, ATTN: AEUTM-P, APO 09102-0156. (2) Civ Spt employees will be assigned only to duties compatible with their individual employment contracts. (1) U.S. military police detention facilities. (2) U.S. courts and boards. (3) Classified areas and facilities, with the exception that Civ Spt guards who are properly cleared may guard M1 tanks and Abrams ammunition. 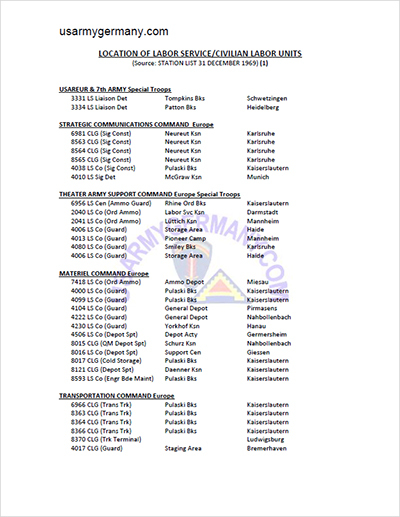 d. Civ Spt units may be relocated within Germany on a permanent change of station (PCS) move after approval of the Commander in Chief, USAREUR. Authority to approve temporary movement of Civ Spt units is delegated to commanders of USAREUR major, separate major, and assigned commands (USAREUR Rep 10-5). The 6941st Guard Battalion and assigned units will not be moved outside Berlin. The temporary employment of Civ Spt employees outside Germany is subject to approval as in paragraph 9 (Employment Outside German; not included here). Inquiries should be submitted in writing to the Commander, USAREUR Civilian Support Agency, ATTN: AEUTM-P, APO 09102-0156.
e. Although Civ Spt employees are organized in units and wear uniform work clothing (UWC), they are civilians and do not have military ranks. Military ranks and titles will not be used, orally or in writing, in reference to Civ Spt employees. They should be addressed as "Mr." or "Herr," "Mrs." or "Frau," "Miss" or "Fraeulein." Civ Spt personnel will wear only UWC or other military accoutrements authorized in USAREUR regulations. f. Civ Spt employees will not take part in routine U.S. Army readiness exercises unless they are connected with maneuvers or similar military exercises defined in USAREUR Pamphlet 690-60, appendix R-X, and are approved by the Commander, USAREUR Civilian Support Agency (UCSA). Written requests for approval will include a detailed justification and be sent through command channels to the Commander, USAREUR Civilian Support Agency, ATTN: AEUTM-M, APO 09102-0156.
g. Civ Spt liaison detachments, centers, and groups are authorized to use U.S. Army postal facilities for official mail. When courier service is available, it will be used as much as possible. Civ Spt official correspondence will be prepared according to AR 25-50. Civ Spt units will not use the DEPARTMENT OF THE ARMY line in the letterhead. a. Wartime use of Civ Spt personnel has been clarified as part of the WHNS Agreement and related implementing agreements. None of these agreements alters the peacetime status of Civ Spt units or personnel. (1) Category A. Category (Cat) A units will transfer their BW eligible personnel and WHNS-committed (OM07) equipment to BW WHNS units, which will mobilize and assume the former missions of the Civ Spt Cat A units. (2) Category B. Cat B unit personnel occupying emergency essential civilian (EEC) positions documented on a U.S. parent unit mobilization TDA and properly identified on the Civ Spt unit's TDA will convert to emergency essential local national (EELN) personnel. They will continue to perform their mission as civilian augmentees to U.S. unit mobilization requirements. (3) Category C. Cat C unit personnel have no wartime mission after disbandment. Eligible Cat C personnel may be used to fill EELN positions or may be assigned to WHNS BW STAN positions during mobilization. c. Military training for Civ Spt Cat A unit personnel is a BW responsibility. Training will be conducted by calling up employees for participation in individual BW reserve training and WHNS unit training exercises. Wartime training for EECs in Civ Spt Cat B and C units will be the same as for other EELN personnel. A generic term indicating the entire Civilian Support (Civ Spt) structure, including all employees. The Civ Spt organization does not have a single commander providing command and control over all Civ Spt units. (1) Civilian Support Center (CSC). A Civ Spt unit that exercises administrative and operational supervision over assigned Civ Spt groups. (2) Civilian Support Group (CSG). A Civ Spt unit with its own administration and mission, exercising control over sections, detachments, and mission accomplishment, or administering assigned personnel integrated into other U.S. Army agencies. (a) Provide liaison between Civ Spt units and USAREUR commands. (b) Assist and advise USAREUR commands on Civ Spt matters. b. 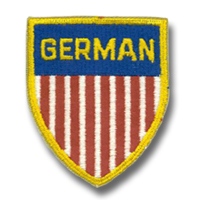 The 6941st Guard Battalion and its assigned units are mobile organizations primarily composed of German national civilians employed in Berlin by U.S. Forces. Although these units are not designated Civ Spt units, they are similar to Civ Spt units. The provisions of USAREUR directives in the 600-400 series apply to these units to the extent that the regulations have been adopted by the Commander, Berlin Brigade, and do not conflict with local laws, tariff agreements, or directives of the Allied Kommandatura. A USAREUR-assigned unit (USAREUR Reg 10-5) under the general staff supervision of the Deputy Chief of Staff, Personnel, USAREUR. (a) Recruitment, placement, and promotion. (d) Classification and compensation management. (f) Leave and absence control. (4) General administration and personnel administration. b. The UCSA carries out Civilian Support (Civ Spt) training, classification, and compensation management programs and operates a supply support activity for Civ Spt uniform work clothing and individual equipment. Until 1953 a medical service as a branch of the Labor Service did not exist. Prior to 1953 the medical support provided to Labor Service (LS) personnel was organized on a unit basis; physicians, dentists, and aidmen were assigned to the various LS units, thus becoming integral parts of the units. LS medical personnel were not supervised or controlled by any medical authority or medical liaison headquarters. 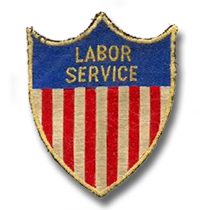 In 1953 separate Labor Service medical detachments were established as organic elements of Labor Service Centers or separate technical Labor Service units. These medical units were advised by the Liaison Surgeon, 3331st LS Liaison Detachment, Heidelberg, on all matters pertaining to the practice of medicine. However, this type of medical was still unsatisfactory and insufficient. All LS personnel in Germany with monthly earnings of up to 660 DM are required by law to participate in the Social Sick Insurance and may receive treatment from German civilian medical facilities. These civilian medical facilities are inadequate to provide medical care for a quasi-military population with regard to hospitalization and dispensary care. Admission to civilian hospitals is generally limited to surgery and other specialized treatment. Therefore, it was necessary for most medical treatment and convalescence to be accomplished at home. But, since most LS personnel are required to live in barracks-type quarters, this arrangement was not satisfactory for the patient, and it exposed other members of the units to respiratory infections and other contagious deseases. LS physicians were generally not recognized by the Krankenkasse (Sickness Insurance) and other professional organizations due to lack of professional background and supervision. Furthermore, the medical support received from civilian physicians who could only be reached outside the kaserne, was most unsatisfactory since the civilian physicians were neither familiar with the Labor Service organization and functions nor were they interested in the conservation of LS manhours. German civilian physicians are more inclined to declare LS personnel "unfit for work" when they could be utilized in other company duties. Moreover, there was a tendency on the part of LS personnel to elect this type of treatment as a means of evading field exercises or using accrued sick leave. Since LS physicians were not recognized by the Krankenkasse and the Association of Social Sick Insurance physicians, they were not entitled to reexamine a patient to determine whether he was physically fit to return to work. The reason LS physicians were unable to obtain permission to practice as Social Sick Insurance Physicians was that the German Federation of Physicians indicated on several occasions they would lend support for the recognition of LS physicians only if there is one qualified LS physician who can be held responsible for the compliance with German laws. Medical care under German social insurance is designed to provide complete medical care for the civilian population. However, adequate medical care cannot be provided for LS personnel based entirely upon civilian medical facilities. Lack of civilian hospitalization facilities and professional personnel have made it necessary to augment medical care with Labor Service dispensaries. Units were dispersed and continued to receive medical service from the parent organization, although other dispensaries might have been in the immediate vicinity. Duplication of medical facilities existed in some areas due to unit assignment. LS physicians were not recognized by the social sick system due to lack of professional background and supervision. This lack of recognition prevented the effective control of LS personnel receiving medical treatment from civilian physicians and further precluded the receiving of medical supplies from social insurance agencies. Medical supplies authorized under TA 77-7 were being used for out-patient treatment, whereas they should have been used for emergency and field use. As a result of these disadvantages it was deemed necessary to reorganize and centralize the whole LS Medical Service, so that medical personnel were organized into separate, independent medical units, and then assigned to a central medical agency for direct control and supervision. After long negotiations between USAREUR Medical Command, Medical Division, and USAREUR Labor Services Division, the LS Medical Service as a branch of the LS Organization was established in June 1955. Twelve Labor Service medical general dispensaries were activated, and together with one medical depot company which was already in existence, were assigned to USAREUR Medical Command. At the same time the 3332d LS Liaison Detachment, until then a veterinary unit, was reorganized and established as the Labor Service Medical Liaison Detachment with assignment to USAREUR Medical Command. It is the mission of this Medical Liaison Detachment to render professional supervision and advise on all matters pertaining to the practice of medicine. Prior to 1952 the veterinary support to LS units was organized on a unit basis. LS veterinarians and meat and dairy technicians were assigned to the various LS units, thus becoming integral parts of those units. LS veterinary personnel were not supervised or controlled by any medical authority or medical liaison headquarters. In 1952 the 3332d Labor Service Liaison Detachment was activated as a veterinary unit. All veterinary personnel were transferred from various LS units and assigned to the 3332d LS Liaison Detachment, which was reorganized in 1955 as the Medical Liaison Detachment. Effective 1 November 1957 all veterinary personnel were reassigned to the appropriate LS Medical General Dispensaries and attached for duty and operational control to the various US VFI teams. At present time all LS veterinary personnel are assigned to two (2) LS Medical General Dispensaries under 549th Hospital Center. On or about 1 January 1963 the veterinary personnel were reassigned to the appropriate five (5) Medical General Dispensaries in the areas where they work. LS veterinary personnel inspects all types of food, meat, poultry, marine products, to determine whether or not proper sanitation, processing methods and contract specifications are maintained in German slaughter houses and other food sources, inspects food products upon delivery to and from ration breakdown point, performs sanitation inspections of LS messing, club, and canteen facilities monthly, performs medical care of sentry dogs, assists in US animal clinics as required, and also work in cold storage plants as directed. The 45th Labor Supervision District was activated on 21 August 1953 by General Order No 25, Hq, USAREUR, Medical Division, 11 August 1953, from the 7779th Army Unit. Following this the 45th Labor Supervision District was reorganized under General Order No 143, Hq, USAREUR, effective 1 July 1955. Applicable TO&E was 20-20R, 18 April 1955. At the present time applicable TO&E is 20-20D, 26 February 1958. The unit again was reorganized under General Order No 392, Hq, USAREUR, 10 November 1959. Authorized strength: 2 commissioned officers and 6 enlisted. The reorganization resulted in an overall reduction in Labor Service medical spaces and in an increase in efficiency of the LS Medical Service since a centralized medical organization was much easier to handle and was operating more economically. Following completion of the overall reorganization of the LS Medical Service, the stipulation of the Federation of Physicians that recognition of LS physicians depended upon a centralized professional supervision was complied with. It was now time to resume negotiations to reach an agreement on participation of LS physicians in the Social Sick Insurance System. This was necessary because adequate medical support to LS personnel could only be given if our physicians had the right to work as physicians of the Social Sick Insurance System. The negotiations were successful in that today all LS physicians in Germany are authorized to work as Social Sick Insurance physicians. Although all LS physicians do have the duties and obligations of physicians of the Social Sick Insurance System, only a few also have the rights pursuant thereto. After the contracts with the local organizations of the Association of the Social Sick Insurance Physicians and the Social Sick Insurance agencies were concluded, the duties of LS physicians had to be divided into two categories to fulfill both the requirements of the US Army and the requirements toward the compulsory insured employee. Consequently, duties were assigned to them as employed physicians of the Labor Service, and duties involving treatments in accordance with German social insurance and German law. Thus the medical support rendered LS personnel in Germany has now reached the highest possible standard since the beginning of the Labor Service organization, chiefly because it was possible to coordinate the two types of LS physicians' duties. The medical support plan was working smoothly and effectively until early 1956 with greatly improved rapport between all factions of Labor Service and medical service personnel. Then early 1956 budgetary factors required an overall personnel reduction of some 33 percent with no applicable lessening of medical support requirements. A new organizational concept was created in May 1956 becoming effective 1 July 1956, and which consolidated the LS Medical Service into four General Dispensaries and one medical depot company, thus materially reducing administrative overhead. This concept imposed a decrease in dental support to a level below that generally considered adequate, and reduced medical personnel to the minimum necessary to provide limited medical care. As a result of realignment of command functions within USAREUR, the LS medical depot company was assigned to ComZ on 1 October 1956. By the end of 1956 the required reduction of personnel and units was achieved. On 1 July 1957 the four LS Medical General Dispensaries and the 3332d LS Medical Liaison Detachment were relieved from assignment to the USAREUR Medical Command, and were assigned to the newly-activated hospital center. On 1 October 1957 the 8044th LS Medical Ambulance Company was relieved from assignment to WACom and was also assigned to the hospital center. Assigned strengths have remained relatively constant until now, with the exception of some vacant spaces which have not been filled because of a shortage of skilled professional personnel. Effective 1 November 1960, both, the 45th Labor Supervision District and the 3332d LS Medical Liaison Detachment, were placed under the Surgeon, USAREUR, for technical direction, by General Order No 480, Hq, USAREUR, 26 October 1960. Effective 20 June 1961 the 45th Labor Supervision District was reorganized under General Order No 128, Hq, USAREUR, 8 June 1961. Effective 7 November 1961 the 45th Labor Supervision District was placed under the 130th Station Hospital for logistical support per General Order No 13, Hq, 549th Hospital Center. Authorized reduced strength is 1 commissioned officer and one enlisted. Authorized full strength is 1 commissioned officer and seven enlisted. The unit again was reorganized under General Order No 166, Hq, USAREUR, 26 April 1962. Authorized full strength is 2 commissioned officers and 6 enlisted. No change of reduced strength. Effective 15 December 1962, both, the 45th Labor Supervision District, and the 3332d LS Medical Liaison Detachment, were transferred from the 549th Hospital Center to the 9th Hospital Center with no change in mission, location, or attachments. On 1 December 1962 the 8071st LS Medical General Dispensary in Berlin, Germany, was activated per General Order No 307, Hq, USAREUR. This unit was assigned to the Berlin Brigade, and to the 279th Station Hospital for operational control, the 45th Labor Supervision District for staff supervision and administrative control, and the 3332d LS Medical Liaison Detachment for professional and technical supervision.